A parade of media reports this week name Penny Pritzker as Obama’s prime choice for Secretary of Commerce. No longer will criminal bankers have to lobby the administration – because now they’ll have one of their own in the Cabinet. Pritzger’s net worth is listed in Forbes as $1.8 billion, which is one hell of a heavy magic wand in the world of politics. Her wand would have been heavier, and her net worth higher, except that in 2001, the federal government fined her and her family $460 million for the predatory, deceitful, racist tactics and practices of Superior, the bank-and-loan-shark operation she ran on the South Side of Chicago. Pritzker introduced Obama, the neophyte state senator, to the Ladies Who Lunch (that’s really what they call themselves) on Chicago’s Gold Coast. Obama got lunch, gold and better – an introduction to Robert Rubin. Rubin is a former Secretary of the Treasury, former chairman of Goldman Sachs and, when Robert met Barry, co-chairman of Citibank. Even atheists recognized Rubin as the Supreme Deity of Wall Street. This article is based on the chapter Penny’s from Heaven? From Palast’s New York Times Bestseller Billionaires & Ballot Bandits with comics by Ted Rall. Donate and get a signed copy. So what did Citibank’s Rubin get for showering Obama with gold? Obama agreed to take care of Rubin’s poodles, Larry Summers and Tim Geithner. They became Obama’s first cabinet picks: Summers as Economics Czar and Geithner as his czarina, Secretary of the Treasury. So, in 2008, Summers and Geithner were put back in the saddle – Obama’s horse but Rubin’s saddle. Rubin received more than $100 million from Citigroup, the gargantuan commercial bank/investment bank/casino created by deregulation. It is worth a mention that Rubin’s centi-million-dollar payoff went unchallenged by Citi’s new owner, the US Treasury, which had put up more than a trillion dollars in loans and guarantees to pull Rubin’s creature out of bankruptcy. Pritzker had taken this state senator/community organizer from the ghetto, made him a US Senator, then, as Obama’s campaign finance chairwoman, raised a mind-blowing three-quarters of a billion dollars to make him president. 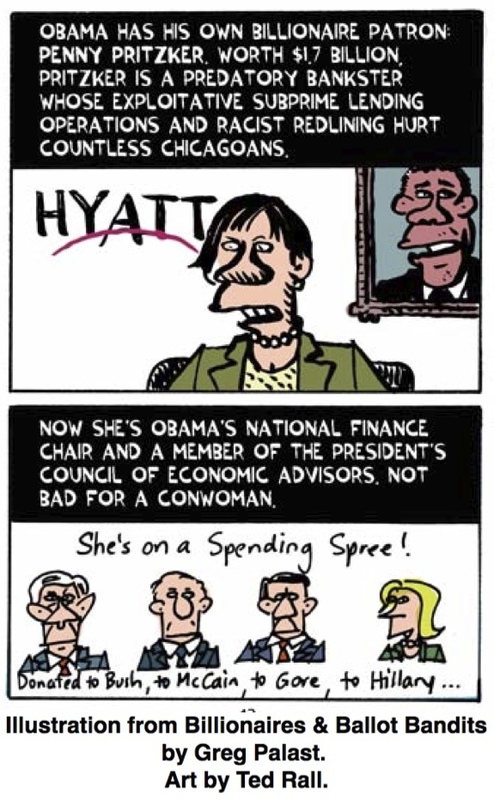 In return, in 2008, Obama decided to make his patron Penny the Secretary of Commerce. But then, in November 2008, just as Obama was about to submit her nomination to Congress, a bunch of Pritzker’s victims marched on Washington. They were not from her busted bank, but unhappy workers from the lucrative nursing homes that her family owns through a string of complex offshore trusts. Obama slammed the door on Penny pronto. The Pritzker family made its billions mostly from Hyatt Hotels and Hyatt nursing homes. Penny, on the Hyatt board of directors, is an infamously combative anti-union apostle. UNITE HERE, the union that represents Hyatt workers, has called for an international boycott of Hyatt hotels. In 2012, UNITE HERE and its parent, the AFL-CIO, were crucial to Obama’s winning Ohio, Michigan and Wisconsin. So, in this last campaign, Obama had to keep his billionairess heiress on the down-low. But today, with the unions’ money and votes already pocketed and counted, Obama can give working folks The Finger and give Penny her pound of flesh: the Commerce post. The New York Times says that, “At Commerce, Ms. Pritzker could provide the president with a new way to reach out to the business community.” The last time Pritzker reached out to the business community was to sell them sub-prime mortgage securities, worthless bags of financial feces manufactured by Superior Bank. If Penny the Piggy Banker gets Commerce, we’ll have to drop Obama’s rating to sub-prime.